The shortage of nursing staff in the UK is cause for alarm bells. Only recently, the Nursing and Midwifery Council (NMC) reported that the number of EU and UK nurses quitting the NHS outweighs the number of newly registered nurses (Oct 2016 – Sep 2017). Data from labour-market analysis tool Jobfeed reveals that, on the demand side, the number of vacancies for nurses has been increasing. 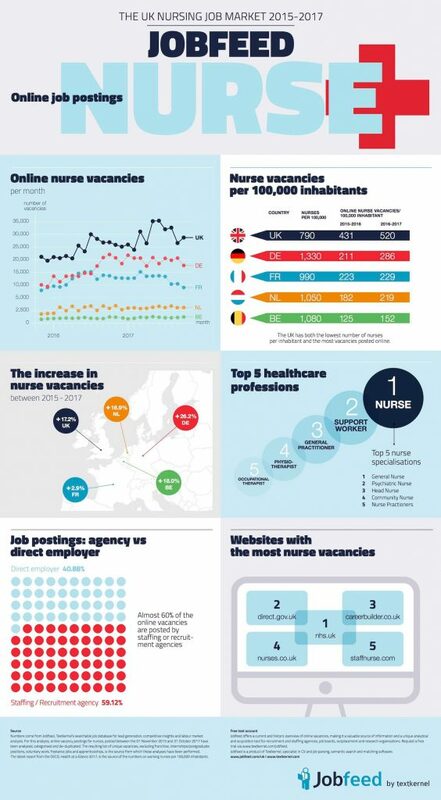 The infographic below shows the demand for nurses in the UK compared to other European countries, specifically Germany, France, Belgium and the Netherlands. The UK has the highest number of online vacancies for nurses. Its demand has increased by more than 17% between 2015–2016 and 2016–2017. Other European countries are also facing this rise in demand. Germany shows an increase of 26%, followed by Belgium with 18%. When comparing the demand for nurses per inhabitant, the UK has both the lowest number of nurses and the highest number of vacancies posted online per inhabitant. There are 790 nurses and 520 vacancies per 100,000 inhabitants in the UK. In comparison, Germany has 1,330 nurses and 286 vacancies per 100,000 inhabitants. This data underpins the concerns of the NHS. With a growing and ageing population, this trend could have severe consequences for securing an appropriate healthcare system for the UK. The big question is: how will the UK, as well as the other various countries, tackle this problem in the coming years? The infographic below shows the state of the nursing job market in the UK compared to other European countries. You can download a .PDF version of the infographic here. In order to gain insights into the UK nursing job market online and its comparison to other European countries, millions of job ads collected by Jobfeed over a 2-year period in the UK, Netherlands, Belgium, France and Germany were analysed. Thanks to the built-in Analytics module of Jobfeed this information was easy gathered. There were 1.5 million de-duplicated job postings for nurses, published between 1 November 2015 and 31 October 2017, in the UK, Germany, France, Belgium and the Netherlands. Franchise, internships/postgraduate positions, voluntary work, freelance jobs and apprenticeships have been excluded from this analysis. Numbers came from Jobfeed, Textkernel’s searchable job database for lead generation, competitive insight and labour-market analysis. Jobfeed offers a current and historic overview of online jobs in the UK as well as in Germany, France, the Netherlands, Austria and Belgium.